Yes, it was a shameful poke in the world’s eye by the dangerously narcissistic, temporary occupant of the White House. Like other unconscionable and unfathomable acts of the early 21st century—a period of historic great change already—Trump’s pulling out of the Paris Climate Agreement has sent me searching for the deeper meaning of it all, while the pundits flail away. The attack on the World Trade Center, an iconic symbol of globalization if there ever was one, triggered for me a period of introspection and a personal existential crisis as it opened up a possible dark side of my previously unquestioned Wall Street-influenced worldview. Then the financial crisis drove a stake in the heart of our failed neoliberal economics and finance ideology, leaving in its wake profound and still unanswered questions. Brexit shined a light on the flawed architecture and economic assumptions underlying the European Union, while Trump’s unimaginable election should force America’s self-anointed elites, in particular, to face their own shadow. Is there not a deeper message being offered up to us as we undergo the shock therapy that is the Trump phenomenon, with his extraordinary ignorance, egotism, and moral ineptitude, most recently evidenced by his unconscionable withdrawal from Paris? It’s worth our reflection: Trump as cosmic messenger, the wake-up call we deserve. Consider the reality. The Paris Agreement is not an enforceable treaty with binding emissions limits. Nor is it even an adequate statement of intention, since even if all signatories live up to their promises, the best scientific projections suggest we will not stay below the intended 2-degree warming ceiling. And, we know we actually need to stay below 1.5 degrees warming, a radically different proposition. Finally, nothing in the Agreement addresses the existential threat it poses to all Petro States since the math implies that 80% of existing fossil fuel reserves, the lifeblood of these societies, must remain in the ground, demanding unprecedented economic transitions requiring a new development paradigm, and that it will that take decades of investment and hard work. See Venezuela for a preview of the challenges to come. Russia is such a Petro-State. Hmm…Calling Jared? So far, the initial response within the United States and globally is actually quite hopeful. States led by California, cities led by Pittsburgh, and a vast cross-section of the business community have been emboldened to show the world (and ourselves) that the “current occupant” does not get to decide for its people on a matter of such grave importance. “We’re still in!” Perhaps the sleeping bear – we, the people – has finally been poked? Second, one primary reason the Agreement was not a binding treaty is that all participants understood that Obama could never deliver the dysfunctional U.S. Congress. So the deeper message we must confront is that many of the leading global institutions of governance, from the United Nations to the United States, to the European Union, are all incapable of addressing the urgent and interconnected global governance crises of the 21st century. Where are the serious plans to address this reality, while at the same time reacting to the unending crises of the day? Third, despite decades of scientific analysis and diplomacy around climate change, we are still working off a horribly inadequate playbook that reduces the complex challenge of restoring balance to the earth’s carbon cycle to simply a call by nations to “cut fossil fuel emissions” by some seemingly random, politically negotiated amount based on what each nation was willing to commit to, that collectively is grossly inadequate to the task at hand. 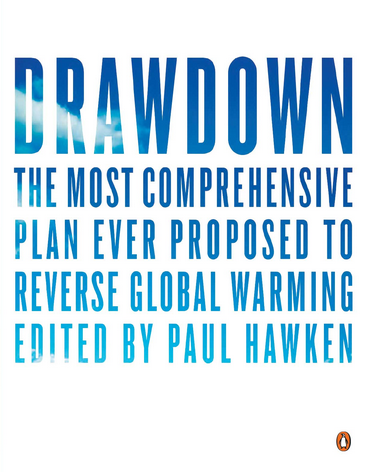 Just in time, Paul Hawken and colleagues have recently published Drawdown. The name calls out the real goal we must embrace: “drawdown” of the concentration of greenhouse gasses in the atmosphere, rather than the insufficient objective of reducing emissions. We are at 402 PPM today and need to get below 350 in the face of a growing population and rising standards of living for the majority of humanity. That’s the task. It demands an integrated, multi-dimensional, rigorous plan. Drawdown provides the analytical foundation for such a plan, documenting the 100 top viable solutions using available technology, and conservative assumptions about their realistic scale-up rates and economics over a thirty-year period between 2020 and 2050. Good news: the math says we can do this! It identifies 1000 Giga Tons reduction in atmospheric CO2 (or equivalent), and requires collectively a highly diversified investment of $30 trillion over thirty years, generating economic savings (in the aggregate) of two and half times that amount, on top of avoiding the worst-case consequences of climate change. To be clear, this represents a profound and unprecedented shift in the allocation of resources from business as usual. That’s the deal. The results from the Drawdown analysis are not what most will expect. First of all, the single largest solution is not solar or wind. It’s refrigerant management. HFCs, the “solution” to the ozone layer problem of the past, turns out to have somewhere between 1,000 and 9,000 times the greenhouse effect of CO2. We must simply swap out the AC, which will have nine times the impact of converting to electric vehicles (only number 26 on the Drawdown list). Who will be the Elon Musk of AC? Perhaps more revealing is the combined impact of family planning and educating women, which, when looked at together, would move to the top, exceeding onshore and offshore wind combined. Population is often a taboo subject. But an extra billion people all desiring to live a middle-class lifestyle makes a massive difference, so we need to be able to talk about it as part of a comprehensive plan. And perhaps most hopeful, the report rightly turns our attention to the amazing natural “technology” we take for granted: photosynthesis, the basis of all life on this planet. Drawdown demands we focus on the massive carbon sinks where carbon is safely stored, in addition to reducing emissions. Remarkably, few realize that our soils are the second largest carbon sink after the oceans, comparable to the world’s forests. Small, achievable percentage changes in the stock of carbon held in our soils, through profitable regenerative agriculture hold massive potential for drawdown, without even factoring in all the ancillary benefits to human health and, therefore, our healthcare crisis, water retention, desertification, and species loss. The role of regenerative agriculture and land use of all varieties, from no-till crop farming to holistic grazing accounts for fifteen of the top twenty-five drawdown solutions. So the message we need to hear underlying Trump’s Paris fiasco: The current occupant will be judged by history; but so will we: wake-up call. The U.S Congress and the Trump enablers in his Administration have a chance to restore their integrity, but no one is depending on it. National leadership on climate has long been outside the U.S. federal government and that’s OK, but it’s a lost opportunity. U.S. states, cities, the U.S. military, and the private sector are already mobilized and that will now only accelerate. We must shift our attention from grand diplomatic gestures by institutions of governance designed for a different time to a rigorous, empowering plan where there is no silver bullet but unlimited and empowering opportunities where the real leaders are already defining our future. Those leaders are us. The goal is simple: drawdown. It’s no easy feat, and time is not on our side. Let’s roll, people.